"A no-nonsense approach covering a breadth of useful topics and applications for librarians, educators, and archivists who have digital retouching projects ahead of them. They should save money by following the author's advice and have fun doing it!" Longtime news librarian Ernest Perez (Houston Chronicle, Chicago Sun-Times) showcases the best of easy-to-use, free, and inexpensive software products for retouching, restoring, and manipulating digital photo images. 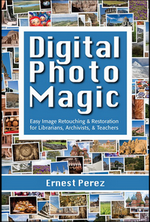 Digital Photo Magic is designed for librarians, educators, curators, and archivists who want to enhance photographic images without the steep costs and learning curves associated with high-end graphic software packages such as Adobe Photoshop. Whether for use online or in print-based collections, exhibits, and archives, you'll learn to easily bring images up to acceptable quality without wasting time or money. Perez provides step-by-step guidance for a range of programs he has personally vetted, highlighting their best features and offering tips and shortcuts you can put to immediate use. A primer on graphic image formats, a guide to image scanning tools and techniques, and an extensive listing of specialized websites, blogs, user forums, and other author-recommended resources are also included. "Packs all the points the novice digital manager needs into an easy-to-understand, yet comprehensive manual. Perez is excellent at explaining the step-by-step procedures for using digital imaging software and not just the how, but the why, in making processing choices."